Uber is a service that provides on-demand car ride. When will uber launch in Bangladesh ? What is the goal of Uber? “Uber has a simple goal: to use technology to make our cities more accessible while reducing congestion and pollution”, said Amit Jain, president of Uber India and South Asia. It currently provides services in 550 cities across 74 countries, with over five million Uber trips made each day on average. How to avail Uber service using Android / Apple store ? Users will have to download the free app from Apple Store or Google Play and sign up using a mobile phone number and e-mail. They can then tap the screen to hail a cab and a driver will use GPS to find their location in minutes. Warning to Female passenger: Do not travel alone as there is risk of getting abused by taxi driver. Despite its growing popularity, the company has faced protests and controversies in countries like Canada, France, Hong Kong, India, South Africa, the US and UK. Take a test ride of Uber service in Dhaka along with your friends, family and have a enjoyable trip. For your 1st ride with discount fare, Use Promo code from your someone who is using uber. 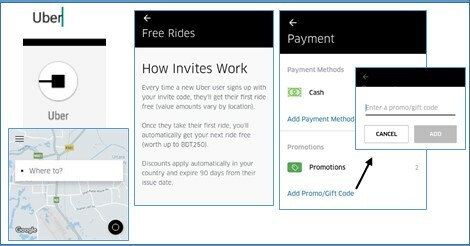 To add, open Uber- app -> Payment -> Add Promo/Gift code -> enter code and select "ADD" . done. বিশ্ব খ্যাত ক্যাব সার্ভিস (uber) উবার এখন ঢাকায় !! কিভাবে উবার এর সার্ভিস ব্যাবহার করবেন ? তো আপনার ফ্রি রাইড বা ভ্রমন টি নিচ্ছেন কবে ?